Soulard Market is the oldest continuously operating Farmers’ Market west of the Mississippi River. Currently housed in two open-sided buildings, it has a closed section between them, forming an “H.” In that closed section, is my butcher shop. Back in my old neighborhood in Jamaica, NY, there were several stores I frequented: a fruit and vegetable stand, a fish store, and a butcher shop. The nice thing about these little stand alone shops is that the proprietors knew get to know you. For example, at the fish store, they always knew I liked the red snapper and the butcher shop knew I liked chuck filets, about a half-inch thick. The butcher shop in Soulard is no different. They cut the New York strip steaks while you’re there, so you get them exactly as thick as you want them. Their chicken breasts are good sized, and Misha loves their Chirizo sausage. They also have exotic meats, such as the Alligator Sausage and alligator-on-a-stick. The prices are comparable to the grocery stores’. Soulard is open Friday and Saturday. 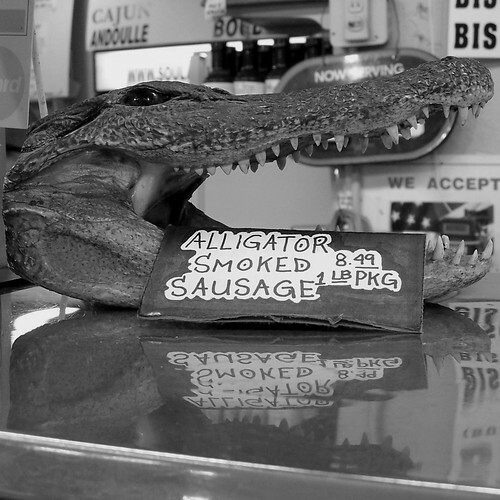 So today’s picture is Alligator Sausage, taken approximately March 25, 2010.